Shortly after wading through the grass, this steel-blue cricket hunter disappeared down a cicada killer hole. This week I was surprised by a frenetic, dazzling blue wasp inspecting shredded bark, small twigs, and miniature caverns beneath edging stones in my butterfly garden. The speed with which this sizable hunter (up to 1 ¼ inch) dashed about the landscape exhausted me merely by observing. But in the case of the steel-blue cricket hunter, prey are elusive and apparently, in this game, speed is of the essence. Steel-blue cricket hunters cover a lot of ground during their search for prey. One of the primary prey items of the steel-blue cricket hunter is the Pennsylvania field cricket. This large boisterous troubadour often invades homes and conducts its arias from the basement in late summer and autumn. 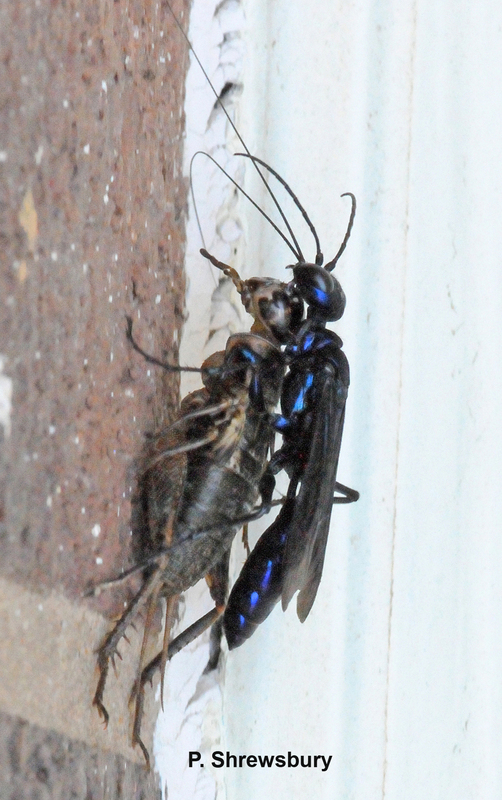 Accounts of the steel-blue cricket hunter describe the wasp flushing the cricket from hiding, pouncing on the victim, and delivering several stings, each laced with potent venom that ultimately paralyzes but does not kill the prey. The wasp then straddles the cricket and using its powerful mandibles, grasps the cricket by its antennae and then carts it away to a subterranean lair. With a cricket securely tucked beneath, this cricket hunter scaled my brick siding, apparently to gain altitude for flight to her nesting site. The lair of the cricket hunter often adjoins the burrow of its larger ground nesting cousin, the cicada killer wasp, which we met in a previous episode of Bug of the Week. Existing burrows fashioned by cicada killers serve as an atrium for cricket hunters, which construct smaller tunnels originating from the shaft excavated by the larger wasp. Within these tunnels, cricket hunters construct multiple cells, each of which may be provisioned with as many as 9 crickets. The female wasp then closes the burrow using stones, bits of wood, and other debris. However, before she leaves each cricket-filled cell, one of the hapless victims receives a lethal gift from the female wasp: an egg, that hatches in about a day. The tiny wasp larva feasts on its natal host, then consumes the larder left by its mother in less than a week. After completing development, fresh new cricket hunters emerge from their pupal cases, escape from the earth, and begin the search for more prey. 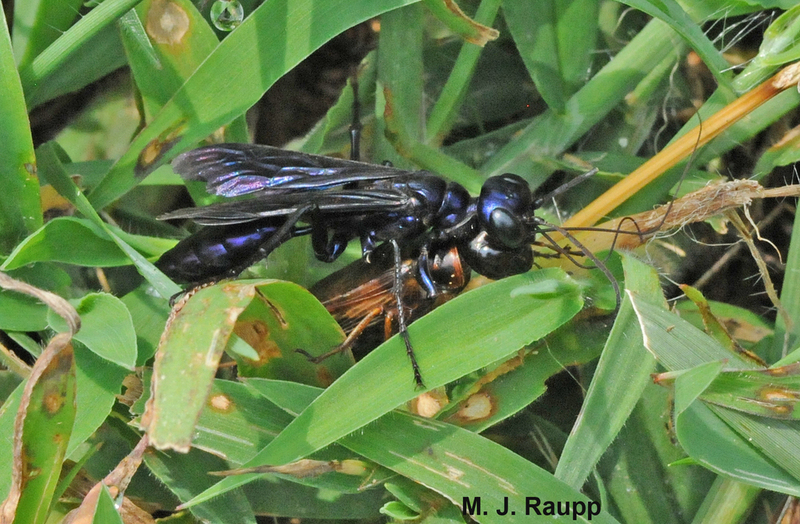 In addition to ridding the world of crickets, steel-blue cricket hunters and other members of the sphecid wasp clan provide important ecosystem services as pollinators and biological control agents of insect pests, including cutworms. For the past several weeks, my bee balm has been bustling with sphecid wasps and bees of several varieties feeding on the nectar provided by the flowers. Once fueled by nature’s ambrosia, these adept predators dash away, seeking insect pests to feed their young. The next several weeks will be excellent for watching these clever hunters at work. A clever bee balm flower delivers a dose of pollen to the back of a sphecid wasp as it forages for nectar. The fascinating article by David Peckham and Frank Kurczewski entitled “Nesting behavior of Chlorion aerarium” was used as a reference for this episode.